Have a good time watching the movie! Hello Grace, thank you so much for your nice comment,I think you have a wunderful blog ! What is going on with that weather huh?? I hope you enjoyed the movie? I hope you have enough food! Should I send you some fried chicken? Now how are they to be delivered? hmmm..
Wonder what it is like not to be able to come out when you want to. Are you claustrophobic? I did finally get my door open by late afternoon. The whole world outside is frozen in ice, and now covered by more snow. Crazy weather! I've been watching the news, those poor people in Australia, after all that flooding now there is another storm hitting them. I hope everybody is staying safe and warm. 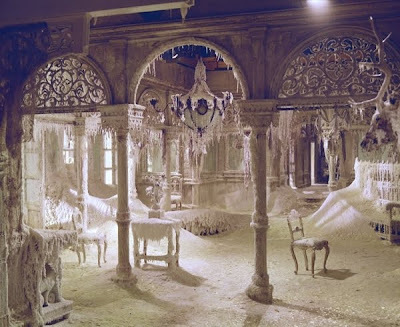 I love the ice palace photo, it seems we are having extremes of weather in both hemispheres. Here in NSW we are fixed in front of air conditioners with 40-degree celsius temperatures outside, and wind to go with it yesterday. Felt like a tinderbox ready to ignite. Hopefully some rain will settle things down soon. Stay warm and enjoy the view from the warm and cozy indoors. I'm glad to hear you finally got your door open! I'm so tired of winter and looking at the dirty grey mounds of snow! I hope spring gets here quick! Espero que ya hayas podido salir de casa, seria genial ver una foto de las maravillas "heladas" que tu puedes ver. Espero que hayas disfrutado de la pelicula y el cafe. Oh! creí que era tu seguidora y hoy me he dado cuenta que no era así. ¡Ahora si!. Preciosa pelicula. La fotografia preiosa. Disfruta en casa ahora que hace este frio fuera.